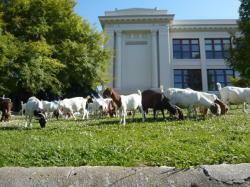 "An Environmentally Preferable Purchasing Policy Opens Doors"
Using goats instead of gas mowers at Santa Cruz High. Seeing the changes implemented - even small ones like 100% recycled paper, or larger ones like green cleaning products at all the campuses, and Soquel High generating its own solar power - creates its own momentum. Cynthia is a trustee with the Santa Cruz City School District. She favors a community based collaborative approach to creating change. Her most recent project is improving food and nutrition at all 10 campuses with an eye towards locally sourced and sustainable foods. With help from Deborah Moore of the Green Schools Initiative, our Steering Committee decided the first goal was to write a policy creating the Green Schools Committee (GSC) and define the broad-based approach that has been key to the committee's success. The GSC's first task was to write an Environmentally Preferable Purchasing policy (EPP) for the School Board to adopt as district policy. This policy became the district-wide guide for all 10 campuses, 7,000 students, and 600 staff. policy and an implementation process. We are still in process but we adhere to the policy guidelines of the " 7 steps." Having a strong environmental commitment at the School Board level has helped to raise the priority of these issues. Cynthia Hawthorne was elected to the Board on a "green" platform in 2006. Board member Sue Lisin had experience with "greening" Monterey Bay Aquarium. Ken Wagman and Bill Maxfield had commitment and communications experience. The Board Resolution and the Green Schools Committee have helped mobilize community members and staff to find resources, new ideas and creativity to solve these problems. Thus far, SCCS utilizes the EPP in all purchases including cleaning products. We have sent a team from maintenance to a Green Cleaning seminar and the workers in turn have trained staff and garnered "buy-in" to use the newer products. We have help from the City and UC Santa Cruz to use the "Iggley model" to measure reductions in our carbon footprint. SCCS has active and award winning life lab gardens in all of our K-5 schools and a grant to incorporate "Hands on Science" and nutrition into the classroom. SCCS is in the process of revamping our lunchtime food offerings and instituting Universal breakfast for every student. We currently have 1 High School that is 80% solar powered with 4 more campuses in process. For the last two years SCCS has partnered with The City, The Water District, State Parks, and local science curriculum expert Julia Davenport, to involve all 5th teachers and students in a watershed conservation unit that includes a field trip to learn about the 7 watersheds that provide water to all of Santa Cruz. SCCS Green Schools Committee will continue our work this next year which culminates annually in a report to the board and the public to coincide with Earth Day. The SCCS Green Schools Committee is comprised of teachers, staff, students, parents, and community experts, and chaired by a school board trustee. Everyone has contributed to our progress as we use the strengths and skills from everyone at the table. There are a bit more than 20 members. The full committee meets quarterly for about 90 minutes for brief report backs. Most of the work is done through subcommittees. Recently however, Lynn Barry, SCCS purchasing manager, was named the "unsung hero" of the year for her work on green purchasing. Mary Ann James, Director of Curriculum and Instruction is instrumental in encouraging teachers to utilize the Watershed Curriculum. he knows sustainability and conservation save money! Every Secondary school has an environmental club and a student representative from each of the 5 schools is part of the GSC. Additionally, each K-5 classroom participates in weekly lessons in the life lab garden. The K-5 schools also recently began parent outreach nights in both English and Spanish to educate parents about nutrition health and the upcoming food revamp effort. Even in the current fiscal climate the board made the decision to keep our 4 life lab coordinator positions as a part of our commitment to environmental science. The SCCS Green Schools Committee has been working together for about 2 years, since 2007. All the changes have occurred during this period. SCCS has followed the guidelines from the Green Schools Initiative. Our most helpful resource has been Deborah Moore. She has been answered our questions directly or referred us to the most updated resources or other organizations. By engaging community Eco experts, parents, students, and staff each step of the way we have found that the energy to move forward comes from our partners. Seeing the changes implemented - even small ones like 100% recycled paper, or larger ones like green cleaning products at all the campuses, and Soquel High generating its own solar power - creates its own momentum. I also think the support of our Santa Cruz Community is very motivating. Each Fall we set and review goals together with the entire Green Schools Committee which currently has 27 members. Then we break into working sub-committees. For example last year we had solar, green cleaning, purchasing, carbon foot print, green transportation, curriculum, and student led projects. The sub-committees will set goals for the year and then we report in to the larger group once a month and review progress toward our goals. It really is crucial to have support from district leadership in both operations and curriculum. Time spent building those alliances is key. Having support from the CFO, Director of C & I, and purchasing is essential. Our most difficult challenge is finding ways to make it possible for teachers to incorporate curriculum. We were surprised to find how little leadership is coming from Sacramento on environmental issues that clearly affect every community that has a public school!